Lebanese Prime Minister Saad Hariri, fresh from a summit with Trump, explains a region in turmoil. Russia won in Syria thanks to President Barack Obama’s inaction. The Middle East unraveling of the past decade is due in no small part to America not listening to her allies in the region. Never mind President Donald Trump’s Muslim-bashing rhetoric, he may just be a better partner. For months, leaders of America's Arab allies in the Mideast have telegraphed this view of the world, and it helps explain why the gilded palaces of the troubled, war-torn region are the few places on the planet — outside Russia — where Trump has been more popular than the president he succeeded. This is the case Lebanese Prime Minister Saad Hariri laid out in an exclusive interview for The Global Politico at the end of a weeklong visit to Washington. The tone was measured, but taken together his comments amount to a striking and stark indictment of Obama and much recent U.S. policy in the Middle East. “The unfortunate consequence of not acting” there, Hariri argues, has been Russia’s restoration as a regional heavyweight, the resurrection of Bashar Assad’s bloody regime in Syria and the failure to produce an Israeli-Palestinian peace deal. “Clarity,” the prime minister says, and the hope for a more decisive approach is the reason why he and other Arab leaders prefer Trump, despite the bombast and uncertainty the first six months of his presidency have unleashed. Unstated, but by all accounts just as significant, is the expectation that Trump will take a more hawkish approach toward Syria’s backers in Iran, and Hariri repeatedly brought up concessions Obama made toward Tehran to get his nuclear deal as an example of how the U.S. lost its way in the region. Given the bloody six-year war in next-door Syria that has come close to overwhelming tiny Lebanon, sending a flood of 1.5 million refugees into a fragile nation of just 4.5 million people and putting the terrorist group ISIS right on their border, it’s a case worth listening to — even if you think it absolves the Arab world of accountability for its own actions. Much of Hariri’s critique of Obama comes down to naivete — and the big gap between America’s inspirational rhetoric and its actions. On Syria, for example, Hariri says that Obama was just taken in by Assad and the Russians when he made a deal with them in 2013 to remove chemical weapons — and that Obama should have bombed Assad when the Syrian dictator crossed his “red line” by gassing his own people. Hariri also faults Obama for the big gap between the “inspirational” words in his 2009 Cairo speech suggesting a new American approach to the region — and the “nothing” that came of Obama’s efforts to forge peace between Israel and the Palestinians. And he points out that while Arab leaders opposed President George W. Bush’s 2003 invasion of Iraq, they were also strongly against the 2011 American pullout of Iraq during Obama’s presidency, a withdrawal that many in the region believe left a dangerous vacuum eventually filled by the rise of the Islamic State in both Iraq and Syria. It is, of course, far easier to criticize the United States for its blundering about the Middle East than it is to explain the fiendishly complicated politics of Lebanon today, a generation after a civil war so devastating it killed nearly a quarter-million people and came to define the bloody extremes of sectarian conflict. Take Hariri’s own situation. At age 47, he is an accidental prime minister, a politician who never expected to be one as a direct result of the assassination of his father, Prime Minister Rafiq Hariri, by a massive car bomb in Beirut 12 years ago. The case is still being investigated by an international tribunal, but the killers are widely believed to have been connected with the Iranian-backed militia Hezbollah and its ally the Assad regime in Syria, as Hariri reminds me in the course of our conversation. Which makes it all the more incredible that Hariri, a Sunni with strong ties to the Saudi royal family, is today prime minister of a government in Lebanon that includes Hezbollah — a ruling coalition that was put together in December 2016 after three years of gridlock, with the Hezbollah-linked Christian leader Michael Aoun as president and Hariri as prime minister. Hezbollah is easily the strongest armed force in Lebanon, and no deal was possible without it, but it means Hariri must perform an agonizingly complicated political dance every day — or risk his government falling apart. The awkward dance was on full display during Hariri’s Rose Garden news conference with Trump on Tuesday. Though the headlines were about Trump’s scathing criticism of his own attorney general, Jeff Sessions, Mideast hands were quick to pick up on an apparent Trump gaffe when the president bragged about Lebanon being “on the front lines” fighting Hezbollah — and seemed not to know that Hezbollah was in fact a part of the government of the man standing next to him. 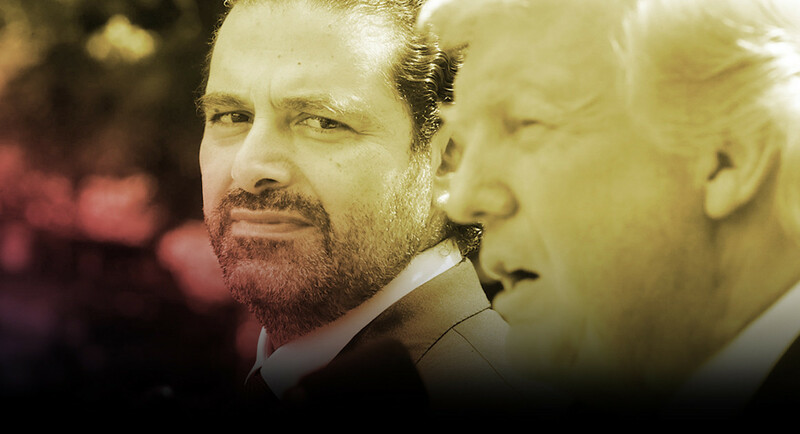 It was a tough trap for Hariri: Acknowledge the screw-up and he’d offend Trump at a moment when the U.S. administration has threatened to cut desperately needed foreign aid or agree with the American president on the need to fight Hezbollah and risk blowing up his own government. In the end, Hariri handled it deftly, brushing off Trump’s mistake and later telling reporters that he was sure from their private meeting that the president had understood the situation correctly. Hariri left Washington not only with his foreign aid intact but a State Department pledge for an additional $140 million to help with Syrian refugees. In our interview, Hariri remained resolutely pragmatic whenever the subject of Hezbollah came up. He’s very clear that the choice was, in effect, to team up with the group tied to his father’s killing or risk another civil war. After three years of Lebanon having no president at all due to its internal gridlock, he argues, what real option did it have? “We saw that if we continue this, we’re going to end up like Syria or we’re going to end up like Iraq,” as he puts it. As for Washington’s demands for more sanctions against Hezbollah and the growing impatience of Iran hawks in the Trump administration, Hariri makes the case that the United States would be better off focusing not on the Iranian proxy in his government — but on Iran itself. Besides, he acknowledges, that’s a matter for someone other than fragile Lebanon to sort out. Lebanon, as Hariri reminds me throughout the interview, is a small country in a tough neighborhood. He’s not in Washington to preach, but to ask, and his mission is not to tell the great powers what to do about Syria or Hezbollah or Iran.